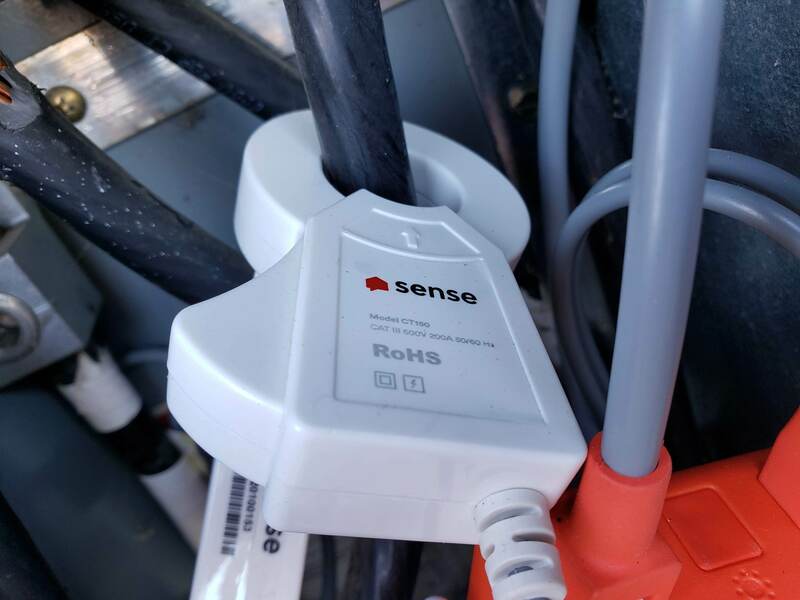 Sense is a bright-orange box that sits in your electrical breaker box and gives in-depth insight into your home’s entire power usage. The whole system is quite clever and—thankfully—free of any monthly charges. But it learns very slowly, and that’s likely to frustrate you. Sense works by electromagnetically listening to the power flowing along the two hot wires that run from your electric meter to your breakers. By measuring the current flow a million times each second, Sense can observe changes in load with precise detail and, based on a machine-learning database, attempt to identify the footprint of different devices from the noise they generate. This means it can tell you exactly how much energy different appliances in your house use, and it does all of this without requiring sensors or smart plugs on each device. Or at least, that’s the simple theory that disguises a very complex process. The device senses electricity flow through a couple of sensors that encircle the two service cables incoming from your utility. Sense has a slightly higher-priced model ($349) for homes with solar systems. It comes with two extra sensors that measure the electricity flowing from your panels, so it can compare the amount of electricity your solar panels are producing compared to the amount of electricity your home is consuming. But it depends on your solar power inverter being connected to your breaker box, versus being connected directly to your utility meter. Sense needs to be added to your Wi-Fi network, and Sense supplies an external Wi-Fi antenna should the signal be too weak inside the metal breaker box. Installing the external antenna is simple if your box is surface-mounted: Just run the wire though one of the box’s existing punch-outs. This will be slightly more complicated if the box is recessed into the wall, but the whole thing is generally well thought out. It’s quite exciting to first launch the Sense app and watch your home’s electricity consumption in real time. 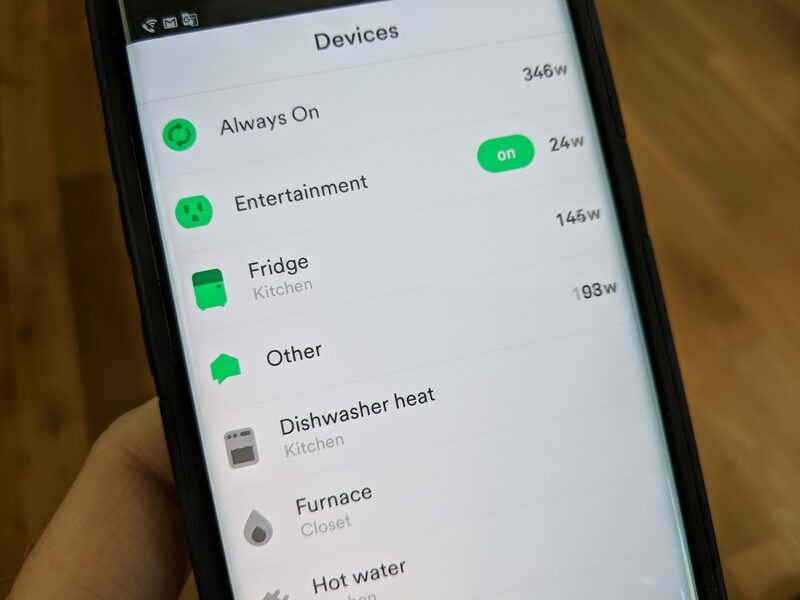 You’ll probably spend a lot of time in the app in the first few days watching the system react as you switch appliances on and off. I quickly learned, for example, that an older set of incandescent fixtures in my bathroom drew an impressive 180 watts—quite a contrast to the LED lighting in the rest of my house. But perhaps the most interesting part is all the stuff that’s always drawing power. The so-called phantom power that your home consumes all the time, day and night without a break. It’s electronics on standby, the clock on your oven, power adapters trickle-charging batteries, and the like. My always-on consumption is 299 watts—remarkably close to the average 288 watts consumed across all Sense homes—and it can become quite a game to try and reduce this. After all, it’s costing me about $30 per month and is slightly less than a third of my entire home’s electricity consumption. It would be great to reduce it. As Sense gets to know your home, it starts to spot the power patterns of specific appliances. This process takes at least a week to begin, and so far it’s identified nine things, including my refrigerator, hot water heater, rice cooker, those power-hungry bathroom lights, my furnace, and the oven. But it hasn’t identified anything else and that’s frustrating. It seems incredibly simple. When I switch on a light, I see the power consumption increase, so why can’t Sense figure it out? Apparently I’m not alone in thinking this: The Sense support forums have lots of people griping about the slow pace of discovery. At CES in January, I had a chance to sit down with Sense CEO Mike Phillips and I asked him about this. He also wishes it could be faster and explained it’s a lot more complicated than it looks. First, the only thing Sense can see is everything together. It doesn’t have the knowledge I do, such as when I’m switching on a light or programming the microwave. To me, it’s obvious these things are happening, but it’s not at all obvious to Sense. It must figure out individual patterns from the complete energy draw of my home. Phillips told me it’s a bit like listening to a room full of people talking and trying to figure out what each person is saying. At first it’s just noise. Some appliances have tell-tale fingerprints—the equivalent of, say, a distinctive accent in the room full of people—that make them easier to spot, but most aren’t so easy to distinguish. 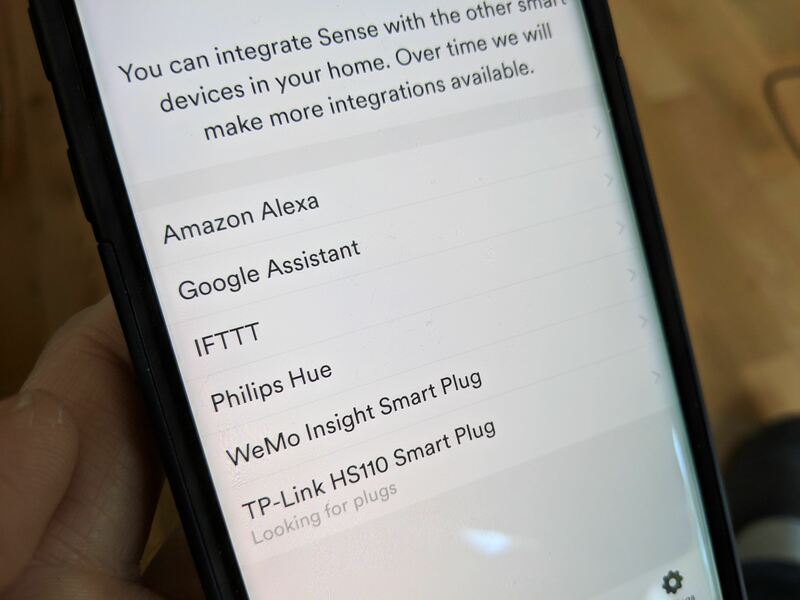 To make this wait a little easier, Sense recently added compatibility with TP-Link Kasa and Wemo Insight smart plugs. These are devices that plug into your wall and then your appliances plug into them. These smart plugs can switch power on and off, but they can also perform their own power-consumption measurements and can talk directly to Sense. If you have a single device plugged in, such as a microwave, then you can label it as such in Sense. It will also add the device’s signature to its database that is shared among all Sense users. At its most basic level, Sense will provide a running total of the amount of electricity your home is using. But things get more interesting once it starts detecting devices. 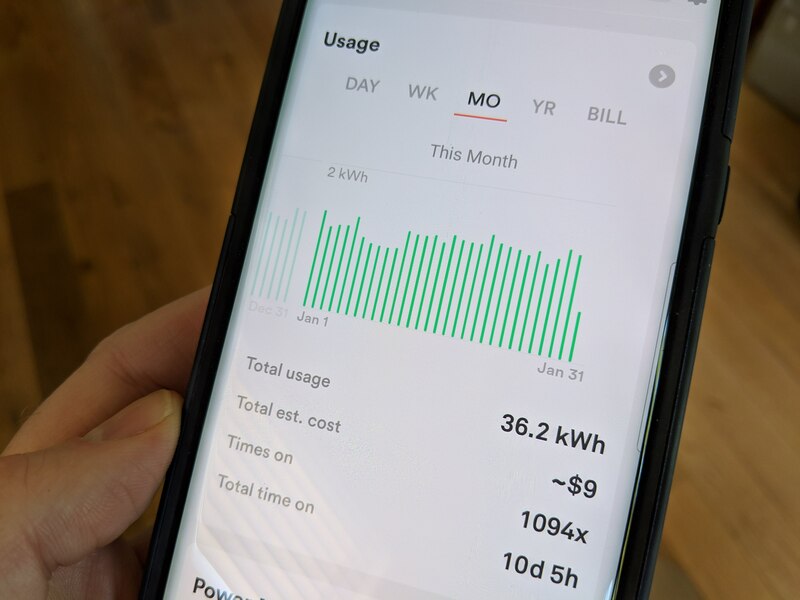 Sense will track usage at the device level and provide a handy summary showing how much each one contributes to your monthly energy usage, the cost of the electricity it consumes—as long as you’ve provided the app with your electricity price—and a graph of how many times per day it comes on. You can also set notifications to pop up when a device turns on or off, and you can add a custom alert for when something is on of off for more than a certain amount of time. For example, I have an alert set if my refrigerator is off for more than an hour. Despite the frustrating pace of automated discovery, the Sense unit is still quite useful. With a bit of manual detective work, you’ll be able to figure out what a bunch of appliances use in your house and track down where all that phantom power is going. It has the potential to save you money month after month through lower electricity bills, and so it should. It’s difficult to justify the $299 price tag otherwise. Perhaps the most exciting thing about Sense is what it could become. More users will mean more data and better detection of devices. 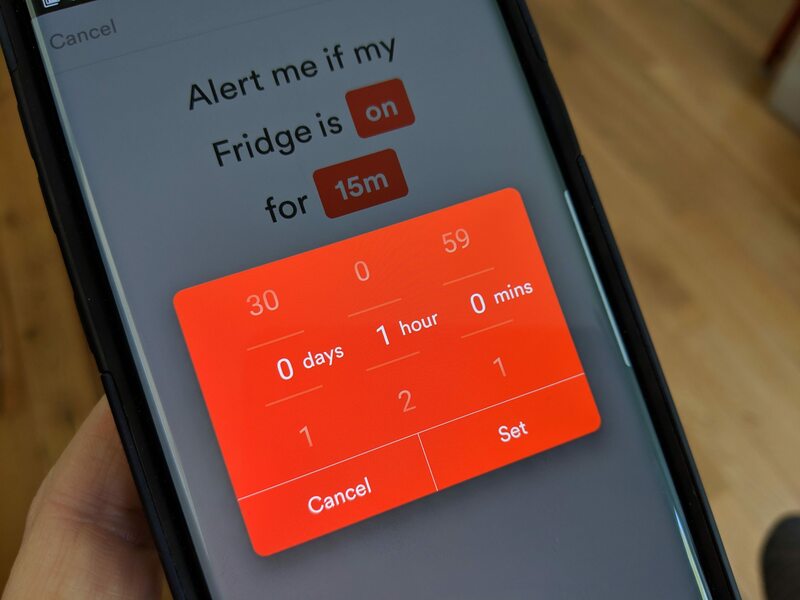 And with that could come much more advanced notifications, such as not just telling you something is switching on or off but telling you of potential faults that are developing before they become expensive nightmares.